We're approaching Feature Freeze and the initial code drop of new artwork for the Ubuntu 9.10. We've already passed four milestones, but there's still lots of cool stuff to look forward to. Right now the art team / DX team at Canonical is working hard on creating a slick boot experience. As mentioned earlier, they have already proposed several different look-and-feel ideas for the boot and GDM. I'm convinced that we haven't seen their last proposal yet. The very talented Mr.Doob has been posting some extremely beautiful ideas on the Karmic Boot Experience wiki and I do believe he has been talking to the people at Canonical. Recently he posted a rather colorful idea that received some mixed feedback. 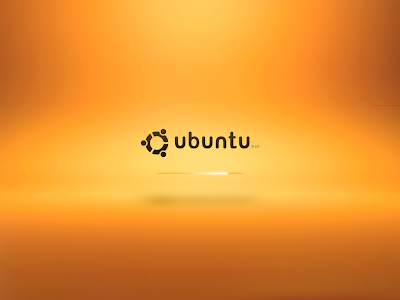 Mr.Doob's latest iteration is more in style with the colors of Ubuntu - as you can see below. Amongst the few things that has been deferred or dropped for this release is the support for installing updates on shutdown. Sadly the DX team does not have the time nor resources to implement this for 9.10 and so it has been deferred from Karmic by the Foundations team. 1. 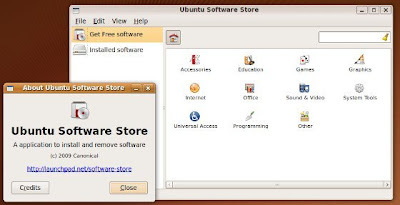 Include in Ubuntu 9.10 a simple and fun interface for finding, installing, and removing software. 2. Increase use of apt: links by Ubuntu enthusiasts, software projects, and ISVs, replacing terminal commands or standalone downloads. 3. Fine-tune the interface presented when software updates are available. 4. Establish a system within Launchpad for registered users to suggest a better description, category, keywords, and/or screenshot for a software package, and for the package maintainer to incorporate those changes into a new version of the package, so that end users can find the software more easily later. Due to the kernel update and EXT4 by default Karmic is already faster than Jaunty (Phoronix has benchmarks) and the work to reduce the time to boot the operating system will continue across both the 9.10 and 10.04 development cycles. The new boot performance target is a 10s boot for Ubuntu 10.04. Ubuntu 9.10 (Karmic) will attempt to step as much in this direction as possible, but is not expected to reach the target. The Migration Assistant will be redesigned and removed from the Ubiquity installer - a decision the will degrade the user experience in my opinion. The migration functionality will be moved into its own application under System -> Administration -> Migration Assistant. It will also been updated to import from the more sources. Lately the new notification system has also been recieveing almost weekly updates. Compared to the version in Jaunty, the notification system will be improved, optimized and introduce new features in Karmic. MacSlow (Mirco Müller), who is writting the code, has change-logs for each release on his blog. I am also very exited to see what will happen with the wallpaper in this release. Will this be the first version of Ubuntu to include a photograph as default desktop wallpaper or will the collection of beautiful desktop backgrounds get tucked away in a package somewhere? Have You Ever Visited The Ubuntu Museum? Looking for Linux Compatible Hardware? A New GNOME Control Center?